NASA’s Juno spacecraft, running on solar power more than 500 million miles from the sun, is on final approach for a Fourth of July arrival at Jupiter for a year-and-a-half campaign of exploration. 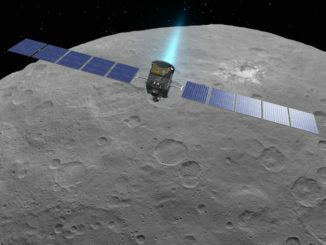 Engineers this week are preparing the probe for a make-or-break rocket burn late July 4 to swing into orbit around the solar system’s largest planet and become the second craft to ever set up residency there. Juno will orbit Jupiter until February 2018, passing within 3,100 miles (5,000 kilometers) from Jupiter’s turbulent cloud tops, nearly 10 times closer than planned for any previous flyby or orbiter mission. The goal of the $1.1 billion mission, which launched from Earth in August 2011, is to survey the deep interior of Jupiter, conduct measurements of its swirling atmosphere and robust magnetic field, and attempt to sort out how the giant world formed at the birth of the solar system. The July 4 main engine firing will take place with Juno on autopilot. It takes 48 minutes for a radio signal to travel one way from Earth to Jupiter, longer than the 35-minute duration of the orbit insertion burn itself. “It’s a one-shot deal,” said Scott Bolton, Juno’s principal investigator from the Southwest Research Institute in San Antonio. “The whole thing is riding on this JOI — Jupiter Orbit Insertion — activity on July 4. Somebody asked, ‘When does the nail biting start?’ It’s already started. We’re getting close. With Juno’s rendezvous, Jupiter will get its first long-term visitor since NASA’s Galileo orbiter ended its mission in 2003. Interplanetary navigators at NASA’s Jet Propulsion Laboratory in California have put Juno right on course for a cosmic bull’s-eye, aiming for a narrow corridor over Jupiter’s north pole to place the spacecraft in the right position for the arrival maneuver. Mission managers canceled a course-correction planned for May 31, and three follow-up burns scheduled this month are also unnecessary with Juno’s perfect trajectory, according to Rick Nybakken, Juno’s project manager at JPL. “We have the best interplanetary navigation people in the world here at JPL, and once again they nailed it,” Nybakken told Spaceflight Now in an interview. Juno’s last course-correction was on Feb. 3, when the probe fired its thrusters to slightly nudge the spacecraft’s flight path, changing its speed by just 0.7 mph, or 0.31 meters per second. It turns out that maneuver was good enough to carry Juno through its July 4 encounter with Jupiter. The spacecraft’s optical navigation camera is tracking Jupiter, and the planet is right in Juno’s crosshairs. “We’ve been seeing Jupiter for several weeks now, so we don’t expect any surprise getting closer,” said Jeff Lewis, Juno’s flight operations lead engineer at Lockheed Martin, which built the spacecraft and sends commands to the probe from a control center near Denver. As of Thursday, Juno was about 6 million miles (10 million kilometers) from Jupiter. It will close that distance over the next 11 days. A shield covering Juno’s main engine opened Monday, the first of several key steps over the next couple of weeks to configure the propulsion system for the July 4 burn. Mission control also uplinked the command sequence for Juno’s arrival, allowing the spacecraft to fly itself through the critical insertion burn, if necessary. But engineers plan to oversee several more days of preparatory activities before handing over control to Juno’s on-board computer June 30. Next week, the ground team will prime Juno for the engine burn by warming up the craft’s tank of gaseous helium used to pressurize propulsion system. Once that step is complete, Juno will pressurize its propellant system, which consists of a mix of hydrazine and nitrogen tetroxide, liquids at stable temperatures that can be stored for years in space. 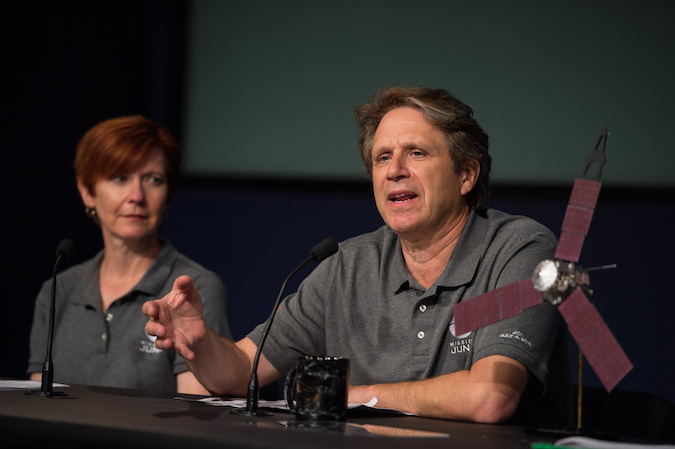 The final commands for the July 4 arrival will beamed up to Juno through NASA’s Deep Space Network on June 30, Lewis said. “It will be completely hands-off from that point, (but) we’ll be ready to do anything, if need be, from the ground,” Lewis said in a recent interview with Spaceflight Now. All of Juno’s science instruments will be turned off June 29 to focus all of the spacecraft’s energy and computing power on the crucial insertion burn set to begin at 11:18 p.m. EDT July 4 (0318 GMT July 5). 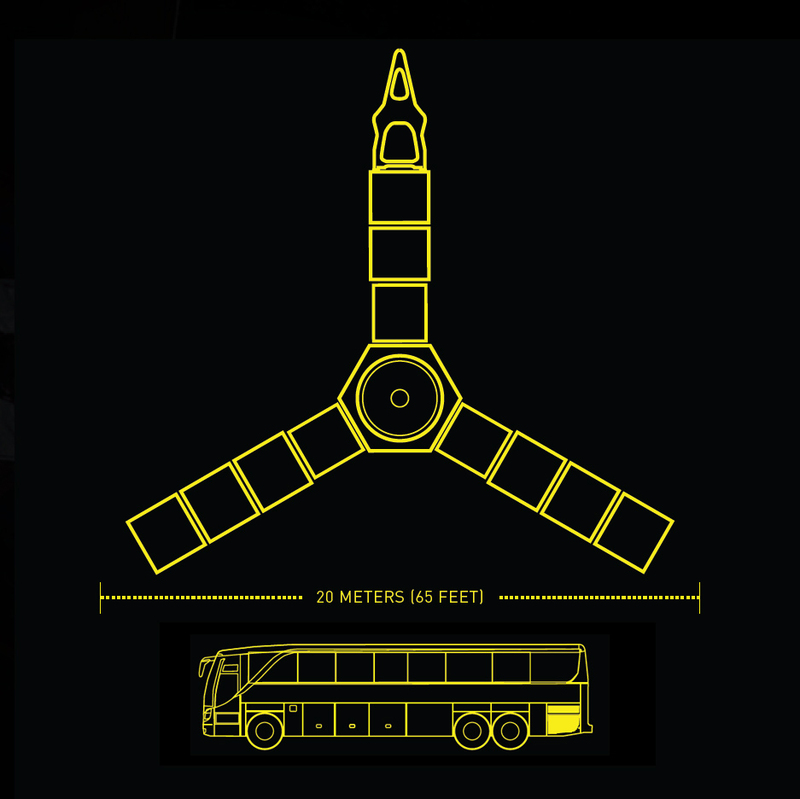 Juno will spin up to 5 rpm for the maneuver, point the engine toward the correct vector, and fire it for 35 minutes. Orbital dynamics experts want to change the spacecraft’s velocity by 1,211 mph (541.7 meters per second), just the right speed adjustment, or delta-v, to put Juno in a wide, egg-shaped 53-day orbit around Jupiter. With its three solar array wings stretching as wide as a basketball court, Juno will reach record speeds as Jupiter’s immense gravity pulls the spacecraft toward the gas giant. On July 4, Juno will top out at more than 150,000 mph (more than 250,000 kilometers per hour) relative to Earth, making it the fastest human-made object in history, according to NASA. Jupiter’s gravity will tug the spacecraft over its north pole, then as close as 2,900 miles (4,667 kilometers) as Juno fires up its engine. 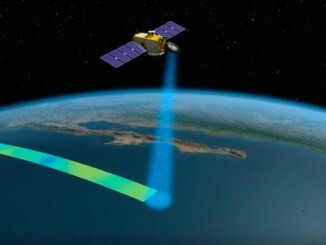 During Juno’s 35-minute burn, engineers and scientists across the solar system on Earth will monitor the maneuver’s progress by listening for tones broadcast by the spacecraft’s radio. Juno will send home tones at different frequencies as the probe achieves key steps during the insertion sequence. The direction required for the engine burn means Juno’s high-gain antenna will be pointed away from Earth, so the probe can only send limited status updates with its low-data rate antenna. The July 4 insertion burn will mark the third time Juno has fired its main engine. Two big deep space maneuvers in 2012 went off without a hitch, setting up for a flyby of Earth in 2013 to slingshot Juno toward Jupiter. That gave officials confidence, but the maneuver at Jupiter will offer new challenges. Engineers and software coders developed commands for Juno to quickly and automatically respond to any fault caused by radiation during the July 4 arrival burn. If radiation triggers a computer reset and interrupts the orbit insertion engine firing, Juno’s software has an “auto restart” feature to resume the burn within a few minutes, Nybakken said. Juno will brush by Jupiter’s extreme radiation belt during each of its planned 37 low passes over the planet during its mission, beginning July 4. 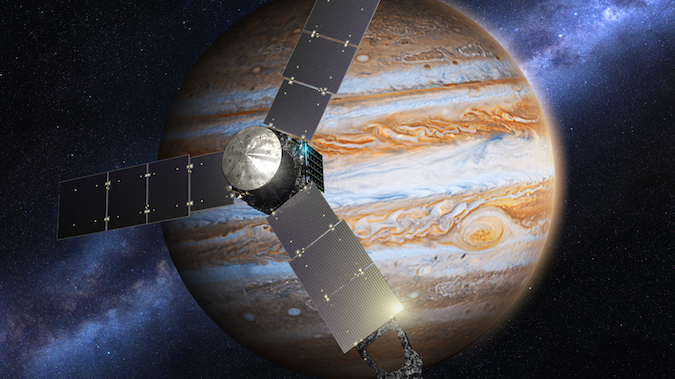 The radiation dose will build on each orbit, subjecting Juno to greater doses of nasty computer-zapping high-energy electrons toward the end of its 20-month campaign. The orbiter will fire its main engine again around Oct. 19 to lower the high point, or apojove, of its path around Jupiter to cycle from a 53.5-day orbit to a 14-day orbit for regular science operations. 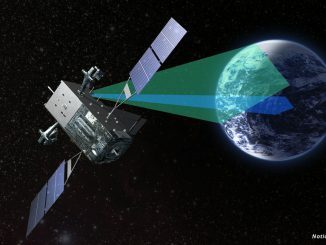 The spacecraft’s vital electronics are housed in an armored titanium box, or vault, to protect against radiation that could damage computers, sensors and other crucial components. Without the titanium shield, Juno likely would not survive even one trip around Jupiter. Scientists predict Juno will be exposed to radiation equivalent to 100 million dental X-rays during the mission. Juno’s first dip toward Jupiter is designed to avoid the worst the planet has to offer, but there are still unknowns. 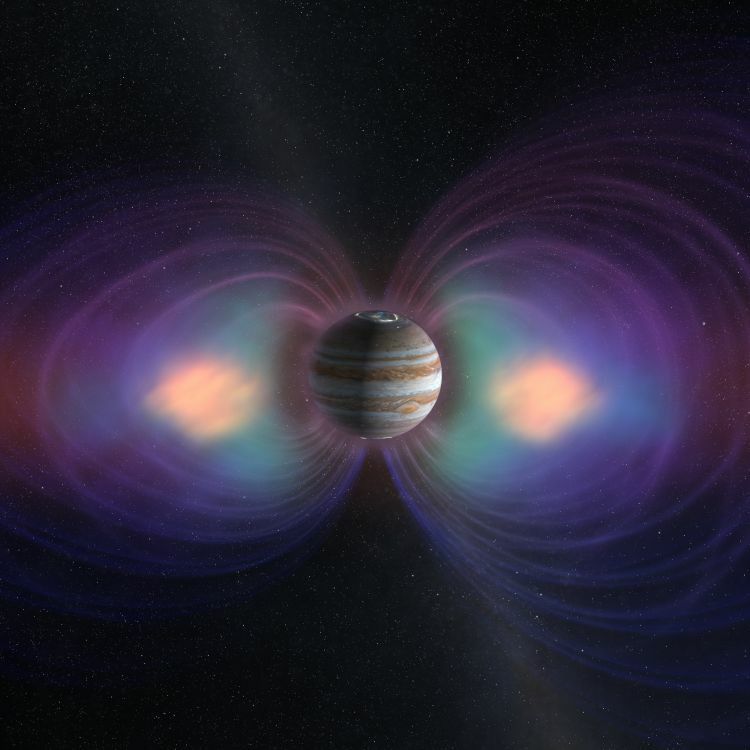 Jupiter’s magnetic field traps high-energy particles in belts like Earth’s, but the scale of the gas giant makes it a “planet on steroids,” Bolton said, accumulating hazards to a craft like Juno.